Finally, the follow up to 1984's Ample Destruction is available for fans. Sure, it's been seventeen years since Jag Panzer recorded this album, but this album is an interesting (and surprisingly good) chapter in the band's history that has been resurrected thanks to Century Media. The only carryover members from Ample Destruction to Chain of Command were Mark Briody and John Tetley. Given the band's relative youth at this point in their career, coupled with an unstable lineup, I really didn't have high expectations for this album. Bob Parduba provided the vocals on this album after Harry Conklin departed. As we all know, Conklin returned for 1997's The Fourth Judgment album, and the band has become a juggernaut of sorts ever since. Despite the struggling with lineup changes and a musical direction, I don't think much more could have been expected from the guys with this album. While listening to this album, I hear elements of 1980's era Virgin Steele, Queensryche, and even Dio throughout. Naturally, the biggest question might relate to the lead vocals. Bob Parduba does a more than adequate job behind the mic with his semi-operatic voice. During the mid tempo sections of the album (She Waits being a prime example), he actually sounds very much like Ronnie James Dio. Parduba doesn't have quite the range or over the top energy and delivery that Conklin has. However, he does have a clean, highly melodic voice that fits the music quite well. As I said before, he uses a modest operatic approach at times, which colors the songs with character and emotion. The guitar work on this album is very solid. You'll hear some impressive dual leads and expressive guitar solos. The rhythm section is also very tight and technically sound; likely making Iron Maiden proud, especially the galloping epic Ride Through the Storm and Sworn to Silence. I found the percussion to be interesting and far from generic. Rikard Stjernquist handles the time and tempo changes with ease, adding many well placed cymbal crashes throughout the album. From a technical standpoint, the guitar work is superb, yet restrained. The guys don't match the energy or power of Ample Destruction, but the songs on this album don't really call for that type of performance. Chain of Command is comprised of mostly mid to semi-fast tempo, riff driven heavy metal with some tempo downward tempo changes and acoustic passages mixed in. The songs are catchy, many of them burning themselves into your memory after first listen. Of course, I did favor some songs over others, but I won't classify any material on the album as filler. As I stated before, given the band's relative youth and their dealing with lineup changes, this is a pleasant surprise for me. While Chain of Command is far from the best work of the band, it's a consistent album. The actual Chain of Command album closes with 2 instrumental tracks (Dream Theme and Gavotte in D), which I found unnecessary. Finally, a previously unreleased bonus track, When the Walls Come Down concludes the disc. Remarkably, Chain of Command does not sound dated at all. This could easily pass for a modern day metal album, and it would be hard to tell the difference. Upon hearing this album, some of you may have a "that sounds very familiar" type of feeling. Well, that's because four of these songs surfaced on later Jag Panzer albums, updated of course to suit the current lineup of the band. Shadow Thief appeared on The Fourth Judgment. Sworn to Silence, Chain of Command, and Burning Heart all appeared on Age of Mastery. Additionally, In a Gadda Da Vida is a metallized cover tune from a hippie band, Iron Butterfly. I'm not familiar with this band anyway, so I would not have even known it was a cover until I read it myself. 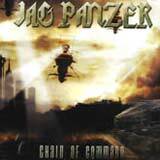 Chain of Command is quite a solid and interesting piece of Jag Panzer's history that is now available for fans. Of course, this album bears little resemblance to the band's sound of today, but I doubt for a minute that any fan of the band will have trouble finding something to like with this album. If you're new to band, this is the wrong album to start with. However, based on its merits, this album deserves the attention of all Jag Panzer fans.